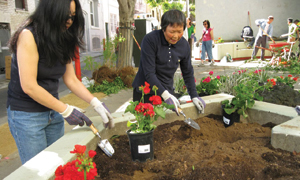 Portsmouth Square is a community treasure and meeting point. People come here to enjoy their free time and there is something to do for everyone. This is a good central place if you're going to spend time in Chinatown. If you have children, they will enjoy the playground. Checkers/Chess players come here too to enjoy the unique competitive vibe. There is Tai Chi practiced here; however, it is very early in the morning. This is also a nice place to relax and people watch, or get lunch to go and eat it here on a sunny day! 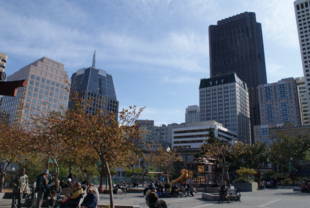 Portsmouth Square is owned by the San Francisco Recreation and Park Department. 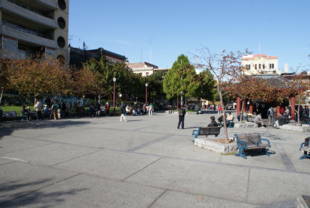 Portsmouth Square is located on the site of the first public square established in the early 1800s in the Mexican community of Yerba Buena, whose name was changed to San Francisco in 1847. During the Mexican-American War, when the Americans were bent on acquiring Alta California, Captain John Berrien Montgomery of the USS Portsmouth was ordered to seize Yerba Buena. On July 9, 1846, the first American flag was raised near the Mexican adobe custom house in the plaza that would eventually be named Portsmouth Square in honor of the ship. Many historical events have happened at the plaza. In 1847, the first public school in California was erected at the southwest corner of plaza. On May 11, 1848, the discovery of gold was announced when Sam Brannan showed his gold to a crowd. On June 12, 1849, a crowd was gathered at the plaza, demanding election of delegates at the Monterey Constitutional Convention. An assembly was organized on July 16, 1849 to fight against a lawless body 'The Hounds.' On August 29, 1850, a memorial service was held after the death of US President Zachary Taylor. The First Admission Day celebration was held October 29, 1850 when California became the 31st state of the United States. On June 1, 1852, a crowd protested against the purchase of the Jenny Lind Theatre as the city hall. On September 18, 1859, Colonel E. D. Baker delivered an oration after U.S. Senator David C. Broderick was killed in a duel with California Chief Justice David S. Terry. In 1987, the park underwent its second major renovation. The first phase involved installing new elevators and bathrooms on the top of the park. 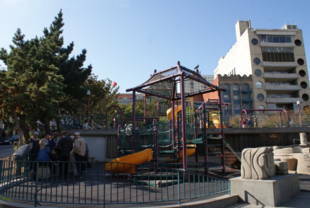 The second phase began in 1994, included installation of child play structures, Chinese chess tables, benches, and landscaping. Phase three included the construction of a new community room and play areas. This $3.9 million renovation was completed and the park was opened to the public in 2001. 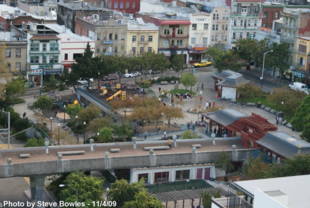 Today, the square is considered a part of Chinatown, earning it a nickname 'Heart of Chinatown.' The park features many markers and statues. A marker for the first public school in California, a marker for the Eastern Terminus of the Clay Street Hill Railroad Company, a marker for the raising of the American flag, and a monument to Robert Louis Stevenson are located inside the park to commemorate its history. Also, a statue of the Goddess of Democracy, a gift from the San Francisco Goddess of Democracy Statue Project to the city, sits in the park.